By leveraging big data & analytics, businesses create the potential to better understand, manage, and strategically exploiting the complex dynamics of customer behavior. Analytics in a Big Data World reveals how to tap into the powerful tool of data analytics to create a strategic advantage and identify new business opportunities. Designed to be an accessible resource, this essential book does not include exhaustive coverage of all analytical techniques, instead focusing on analytics techniques that really provide added value in business environments. 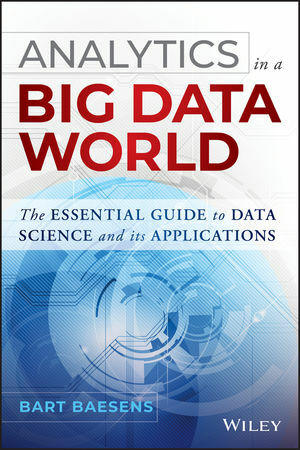 The book draws on author Bart Baesens' expertise on the topics of big data, analytics and its applications in e.g. credit risk, marketing, and fraud to provide a clear roadmap for organizations that want to use data analytics to their advantage, but need a good starting point. Baesens has conducted extensive research on big data, analytics, customer relationship management, web analytics, fraud detection, and credit risk management, and uses this experience to bring clarity to a complex topic. BART BAESENS is an associate professor at KU Leuven (Belgium) and a lecturer at the University of Southampton (United Kingdom), as well as an internationally known data analytics consultant. He is a foremost researcher in the areas of web analytics, customer relationship management, and fraud detection. Baesens is also co-author of the book Credit Risk Management: Basic Concepts (Oxford University Press, 2008).